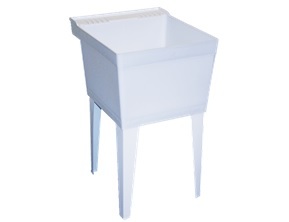 Fiat Single Laundry Tub With Legs - Holmes Plbg and Htg Supply Co. The single compartment Tub-Tub™ laundry tubs from Fiat Products, is manufactured from a molded, fine celled, structural plastic polymer. The basic model number is SF-1 and has an integrally molded drain. Plastic stopper and tail piece nut with washer are supplied with all models. Water capacity is twenty (20) gallons. Outside, front to back dimensions are equal to laundry room appliances (washer and dryer). Overall outside dimensions measured at the top of the tub, are 20" x 23 7/8" x 14 3/8" and inside, compartment dimensions, measured at the drain opening, are 19 1/4" x 19 1/2" x 13". A 4" ledge, integrally molded at back of the unit, includes two (2) soap dish locations and two 1" diameter molded holes. Holes are used to accept an optional, 4" on centers deck faucet. NOTE: Certain geographic locations require no holes in the back ledge, and are molded accordingly. The floor mounted Tub-Tub™ model SF-1-F shall be supported by factory furnished, white baked enamel steel angle legs that fit into the molded retainers located in each of four corners of the underside of the laundry tub. The fully assembled model shall withstand loads of up to 250 lbs. Legs are supplied with leveling devices. Recommended height of installed unit, from floor is 33 3/4". The wall hung Tuf-Tub™ model SF-1-W shall be supported by a heavy guage, galvanized steel mounting bracket capable of being secured to the wall with mechanical fasteners and capable of withstanding loads of up to 250 lbs. Side fillers and bottom tub supports, made of white, molded plastic polymer, are factory supplied and assembled in the field in accordance with installations instructions. Recommended height of unit from floor is 33 3/4".